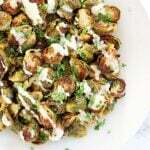 Perfectly caramelized Brussels sprouts are topped with a lemony garlic tahini sauce in this elegant yet fuss free side dish. Growing up, I absolutely hated Brussels sprouts. Luckily, they only showed up on my plate a couple of times a year at family gatherings like Thanksgiving and Christmas. As an adult, I now look forward to sprouts season and can’t get enough of them. 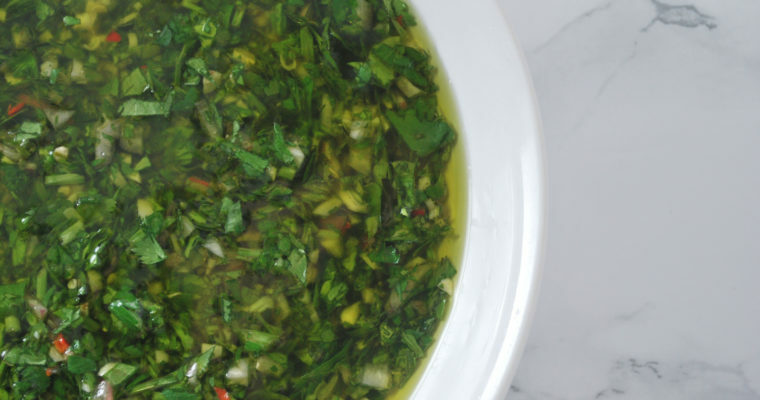 If you’re not on the sprouts train yet, I would highly suggest this recipe as a way to introduce them into your diet. Roasting the sprouts brings out a bit of a sweetness to compliment the slightly bitter flavour, and the sauce is creamy lemon garlic perfection – in fact you will want to eat it on everything which is a good thing, because you will have tahini sauce leftover after drizzling the sprouts with it. 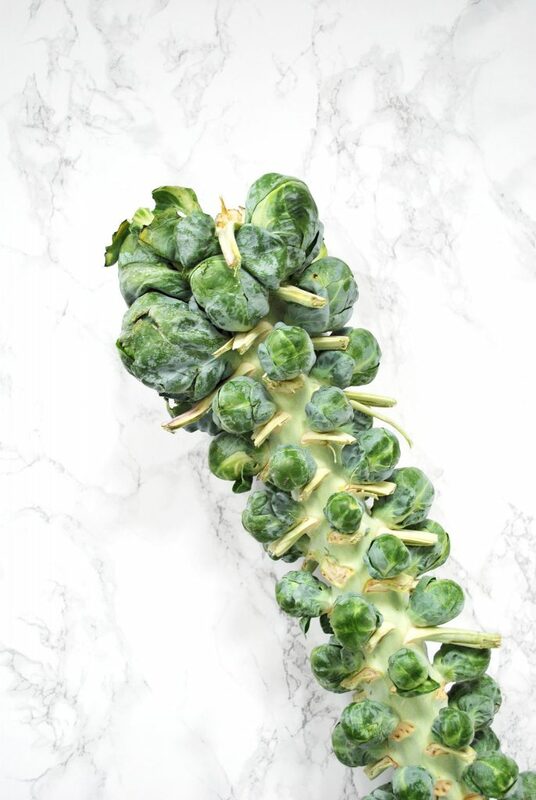 Fun Fact: Did you know that Brussels Sprouts were grown on a stalk?!?!? I picked up this beautiful stalk of sprouts at our local farmers market and set straight into roasting up these beauties. Although they look really cool on the stalk, the only benefit of buying them this way that I could think of would be that the sprouts are fresher when you purchase them. Taking them off the stalk was quick enough – I just used a paring knife to pop them off one at a time. This dish honestly couldn’t get any easier. Besides making the food taste great, roasting is one of my favourite methods of preparation because it is pretty hands off – just pop a tray in and take it back out when the cooking time is complete. 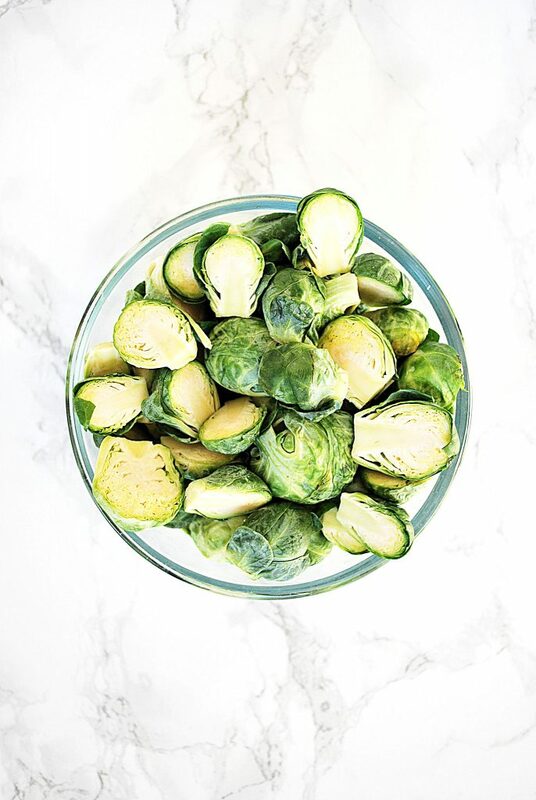 All you have to do is pre-heat your oven to 400℉, toss your sliced Brussels sprouts with some cooking oil, season, toss in the oven, and whisk together the sauce ingredients while your oven does all the work for you. Halve the Brussels sprouts lengthwise and add to a medium sized bowl. Add olive oil and season with salt and pepper. Toss to coat. Line a large baking sheet with parchment paper or silicon baking mat. Add the sprouts to the sheet and space them out as much as possible. While the sprouts are roasting, add the tahini sauce ingredients to a small bowl and whisk until smooth. If the sauce is too thick, add water a little bit at a time until it reaches the consistency you like. 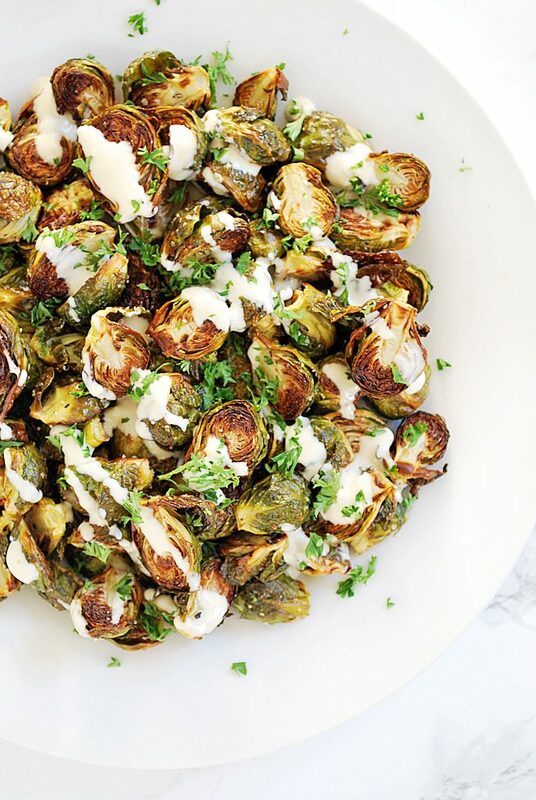 Place the roasted sprouts on a serving tray and lightly drizzle with tahini sauce. Absolutely loving the sound of that lemon tahini sauce! That sauce sounds amazing! This makes my regular roasted brussels sprouts seem quite boring. Ha! I have recently started getting into brussels sprouts after disliking them for many years. This recipe is next on my list – they look delicious drizzled with the tahini sauce. I can usually find stalks of brussels sprouts at Trader Joe’s around the holidays. It’s my favorite way to buy them! 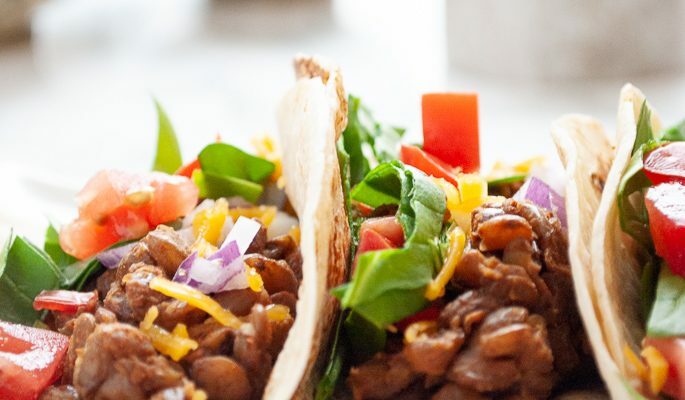 Your sauce sounds like a great pairing with them! What a beautiful creation. 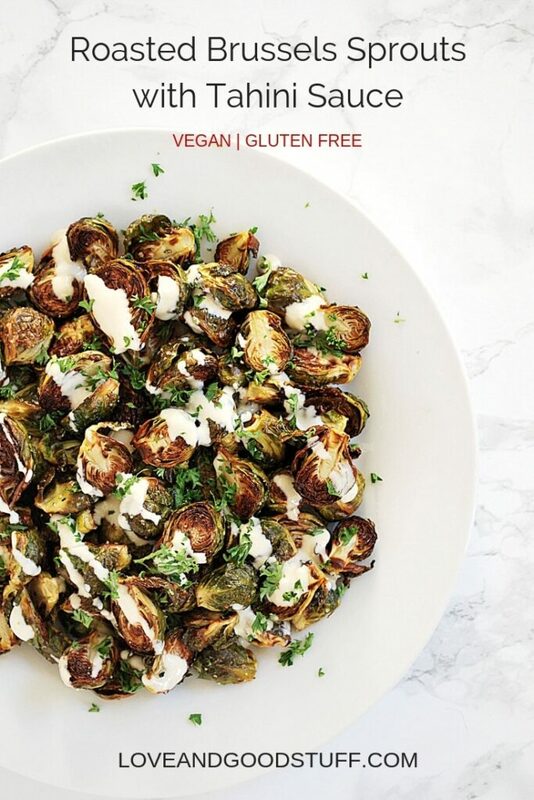 I love Brussel sprouts and the tahini sauce! Definitely great for the holidays coming up!! These look so delicious and the lemon tahini sauce is the perfect creamy accompaniment to the sweet, roasted veggies!